Owning a dog welcomes a host of benefits and I’m not just talking about the obvious advantage of having a fun and friendly companion in your household. We know our dogs make us happy, but could they also be making us healthy? Experts say yes, dogs really do make the world of difference. Whether it’s by lowering blood pressure, reducing stress, or detecting serious illness early, dogs are unrivalled in the stakes for ‘man’s best friend.' The facts speak for themselves – dogs really can enhance our quality of life just by being there. 1) Heart health – unlike many of us humans, dogs love to exercise and play. Never happier than when they are frolicking outdoors, their hearts are racing and they are on-the-go, most dogs are able to keep off the pounds and maintain good heart health. For us, having dogs means getting out-and-about and experiencing the great outdoors with them, whether it’s a walk around the block, a game of fetch in the park, or some harmless rough-and-tumble indoors. Having a dog means exercise – whether you like it or not! Moreover, research strongly suggests that having a dog lowers heart rate, blood pressure and cholesterol, improves sleep patterns and strengthens the body’s immune system. People with heart disease are also likely to live longer if they have pets, and generally have a longer life expectancy following a heart attack. 2) Better immunity – these days, you only have to turn on the television to be confronted with an advert for cleaning products; humanity is on a crusade against germs and we won’t be content until we have wiped out every last one of them. In reality, our bodies need germs to keep our immune systems strong, so, when we’re not exposed to them frequently, we can quickly become ill when eventually we are. Dogs are teeming with germs and having one in the house exposes us to them every day, which only strengthens our immunity. People with dogs are therefore less frequently ill and are less likely to be affected by allergies and asthma. Dog owners also visit their GP’s less and take fewer prescription medicines. 3) Stress reduction – it is no secret that dogs affect our mood and can change our outlook on life. Rates of depression are significantly lower in the pet-owning population with people reportedly feeling less isolated, less stressed, and less negative with their furries at their side. Routine and consistency are also great remedies for depression – two things dog ownership provides. 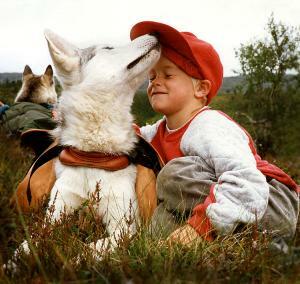 Likewise, having a dog gives purpose and responsibility, which in turn can make a person more focused and content. Experts say that caring for a dog may also ‘give [you] a sense of your own importance and value.’ It is harder to stay inside feeling down when you have a dog that is itching to get out and play and is relying on you for companionship. Research suggests that simply petting your dog can reduce heart rate and levels of stress hormone. 4) Predict and alert to problems – for those who suffer with on-going seizures and episodes of hypoglycaemia, dogs can be specially trained to detect an imminent crisis and alert their owners 15-45 minutes before it happens. This allows whoever affected to call for help or find somewhere safe to lie down. 5) Social interaction –if I stopped in the street to talk to someone I didn’t know, people would look at me suspiciously. But if I stopped to talk to someone because they were standing with their dog, it would be much more acceptable. Similarly, if I was the one with the dog, studies show people would be much more likely to trust me and enter into a friendly discussion, despite not knowing who I am. Whether it’s making friends in the park, exchanging small talk in the street, or being part of a dog club or association, our social lives are only going to benefit from having a dog. And if our social and emotional lives are happy, our physical lives are surely going to be too. Having my dog in my life certainly gives me purpose and value. I have to get out of bed no matter how bad my pain is or how low my mood because my dog has to be fed and has to go to the loo! I can't stay down once I get outside with him and he never fails to make me smile and feel happy just with his enthusiasm for life and his absolute joy of running. I am sure he is smiling as he bounds across the fields, head held high and proud, tail wagging as he runs to retrieve his hoop or ball. Then when we get home there's the time for bonding while I dry and feed him and he eventually curls up at my feet or by my side, content and sleeping. Total trust, unconditional love and affection. Dogs have no hidden agenda, they just give because they can and they want to. I must say that really enjoyed this article and found myself smiling and nodding as I read each line! I adopted my greyhound/Saluki in September 2013 after breaking up with a partner, and having him in my life was a wonderful distraction form feelings of depression, he truly helped me through the heartache. Then when my Mother became seriously ill from cancer, again having him around kept me from falling into a pit of despair, after coming home from the hospital he would be waiting for me with his tail wagging and his eagerness and pure love. Sadly my Mum passed away in October 2014 and my dog was undoubtedly the most positive coach in my life as I tried to work through my grief. He motivated me to get out into the fields and countryside, and seeing him bounce about and run across the grass playing with his doggy pals with a look of sheer joy on his face was one of the most uplifting things to me. Then coming home and cuddling up by the fire after a meal gave me such a feeling of well being. He continues to take care of me as much as I take care of him and I truly believe that dogs have an inbuilt skill at counseling those around them! Its a symbiotic relationship that is second to none.